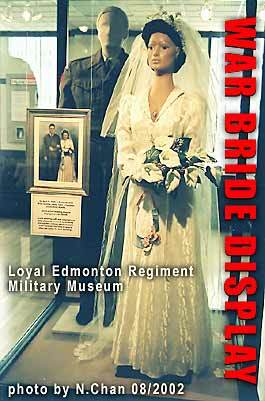 Military Museum of the Loyal Edmonton Regiment - One of the best kept secret tourist destinations of Edmonton, Alberta? On April 11, 1945, in Scotland, Jane Allan married James Todd, a Canadian soldier from Alberta. Jane's actual wedding dress is displayed in this cabinet. Jane's wedding outfit was acquired in a time of wartime austerity by relatives pooling their clothing ration coupons. Later Jane lent the dress to several other war brides for their weddings. In the top left picture of this page we have museum curator, David Haas pointing out several Hudson's Bay "trade rifles" and a musket, items that were in use at the time of the Louis Riel "Rebellion". Of interest are uniforms of Canada's Home Guard, who among other things staffed Prisoner of War Facilities in Canada and dealt with some bloody riots, as well they served to patrol various installations of strategic defense value across the country during the war. There is also large display case of uniforms and equipment of Women's Army Corp members - reminding us that the Second World War had for the first time a large contingent of women in the uniform. There are of course collections of medals for distinguished service and bravery, from the first and second world wars, pistols, rifles, machine guns, helmets and uniforms. Note - the display of communications equipment includes cavalry bugles, field telephones and a short wave radio receiver-transmitter originally sent to our Soviet allies to use (thus the instructions in Russian). We are again thoughtful that the "Internet" was initially developed by the US military as a multiply redundant communications system in the event of nuclear war disrupting contact between cities and installations. The short-wave radio unit points out how much some things have changed in communications technology. within the past 70 years. I spent a delightful afternoon visiting with Major David Haas, the curator, sharing stories of our War Bride mothers and their war stories, and of my father and his S.O.E. unit in Borneo, hearing from their short-wave radio about V.J. Day (Victory over Japan) celebrations, while their Canadian-Chinese Unit was still on active patrol in the jungle -- as many Japanese garrisons had not received official orders about the war ending. They didn't have CNN or the Internet for upto date news then. The museum's resources include a corps of dedicated volunteers that work in another section of the building (under the display rooms), sorting, preparing, preserving, cataloging equipment, clothing and other artifacts for this museum's collection development. This Museum and the Edmonton City Archives can be a great way for an individual, students or families to spend an afternoon or even a day. Check out the respective web sites of these two historic information resources, for more information. If you are a history, museum or historic archives enthusiast in Edmonton, Alberta you should visit this museum. note the Military Museum is on the ground floor. are also located in the center of the Prince of Wales Armouries - so you can spend a delightful whole day visiting these two great historical resources! Credits: the images on top banner are by Neal Chan taken for the publication Provenance.ca magazine for librarians and archivists with permission of the Curator of the Military Museum, Major (ret'd) David Haas, Edmonton in August 2002. The inclusion of these pictures and materials in Metrotown.info is purely to help promote this great Canadian museum collection at a time when Canada is becoming more involved with military operations in other parts of the world.